Why is it so difficult to stop smoking? Why do some people relapse months after giving up? Scientists from the Institut Pasteur and the CNRS, in collaboration with Sorbonne University and Inserm, have demonstrated that a genetic mutation already known to be involved in sensitivity to nicotine also plays a role in relapse behavior after cessation in rats. The findings will be published in the journal Current Biology on October 4, 2018. Nicotine dependence, a chronic condition with a high rate of relapse, is the leading preventable cause of death in developed countries. Seven million people die from tobacco use every year worldwide. Nicotine, the main psychoactive compound in tobacco, causes this addiction by binding to the nicotinic receptors in the brain. In so doing it activates the reward circuit and creates a feeling of well-being. An individual’s tobacco consumption is therefore closely linked to the sensitivity of these nicotinic receptors, which are composed of five subunits. In recent years, several large-scale human genetics studies have demonstrated that a mutation in the CHRNA5 gene that codes for the α5 nicotinic receptor subunit is associated with a significant increase in the risk of nicotine dependence. The mutation is highly present in the general population (approximately 35% of Europeans carry it and up to 50% of the population of the Middle East). 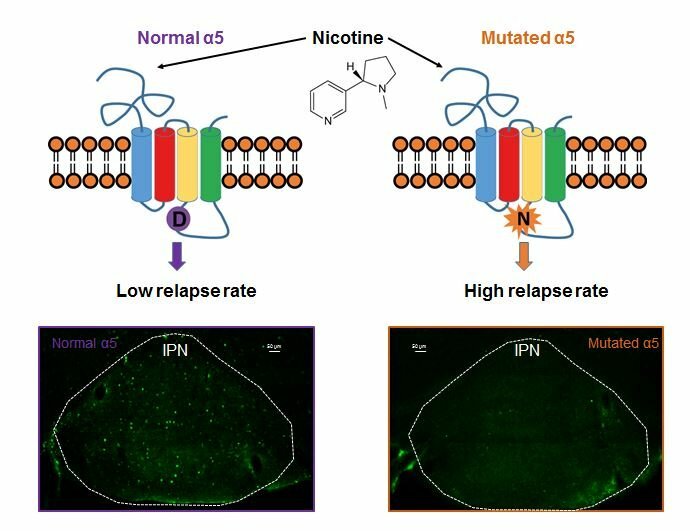 These findings led scientists from the Integrative Neurobiology of Cholinergic Systems Unit (Institut Pasteur/CNRS) to attempt to determine what stage of nicotine dependence is affected by this mutation and to understand its mechanism of action. The scientists introduced the mutation to a rat by using a recent molecular genetics technique. They then evaluated its effect on various behaviors associated with nicotine dependence and demonstrated that it resulted in greater nicotine consumption in higher doses, as well as an increased rate of relapse to nicotine-seeking behavior after cessation. Interestingly, the research showed that this effect on relapse was associated with reduced neuronal activation in the interpeduncular nucleus, a brain structure with the highest concentration of α5 nicotinic receptor subunits. “This study enabled us to assess the impact of this mutation on various stages of nicotine dependence with a greater degree of accuracy. It provided us with an initial explanation for its mechanism of action, which promotes relapse to nicotine-seeking behavior after smoking cessation,” explains Benoit Forget, lead author of the paper. “The results suggest that a drug capable of increasing the activity of nicotinic receptors containing the α5 subunit could reduce tobacco consumption and lower the risk of relapse after cessation,” adds Uwe Maskos, Head of the Integrative Neurobiology of Cholinergic Systems Unit (Institut Pasteur/CNRS) and last author of the paper.